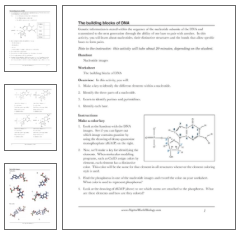 This learning activity is designed to help students use molecular structure images without the molecular-viewing software. Students work with images from Cn3D on paper (or on screen as a pdf document) to identify nucleotides, base pairs, and parts of nucleotides. If you’re an instructor, you can also use the image page as a quiz. If you’re a student, this is a great way to learn about the four bases in DNA and review their structure. 2). Worksheets - Only a few pages are shown here. 3). 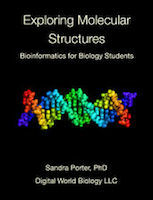 A page with nucleotide images.